Not only is smoking bad for your lungs, but new research shows that components in cigarette smoke directly damages your muscles. The research, published in The Journal of Physiology, indicates that smoking decreases the number of small blood vessels that bring oxygen and nutrients to muscles in the legs. We know that smoking limits a person's ability to exercise because it makes their muscles weaker. It was widely believed this muscle weakness is because the lungs become inflamed and eventually destroyed by habitual smoking, therefore limiting activity and exercise. 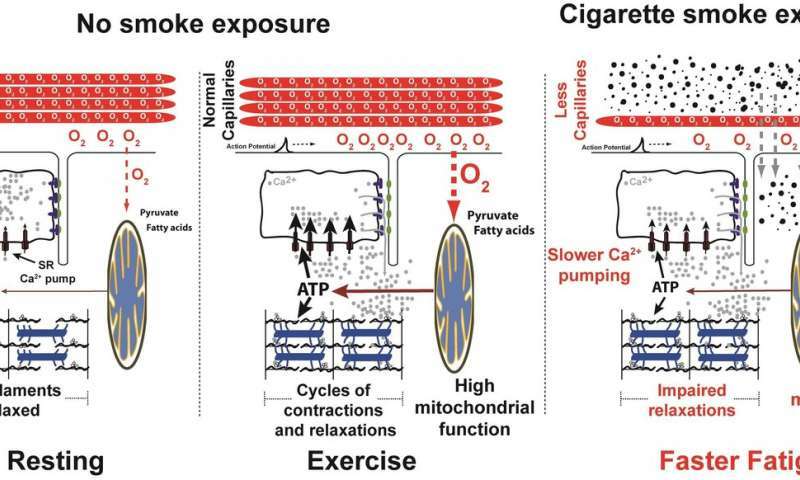 However, the findings of this study suggest that cigarette smoke directly damages muscles by reducing the number of blood vessels in leg muscles, thereby reducing the amount of oxygen and nutrients they can receive. This can impact metabolism and activity levels, both of which are risk factors for many chronic diseases including chronic obstructive pulmonary disease (COPD) and diabetes. The research conducted by the University of California, San Diego in conjunction with Universidade Federal do Rio de Janeiro and Kochi University, involved exposing mice to smoke from tobacco cigarettes for 8 weeks, either by inhalation or by injecting mice with a solution bubbled with smoke. The study did not identify which of the approximately 4,000 chemicals in cigarette smoke are responsible for this muscle damage. Identification of the responsible chemicals is a key avenue of further research, along with understanding the process by which they reduce the number of blood vessels.